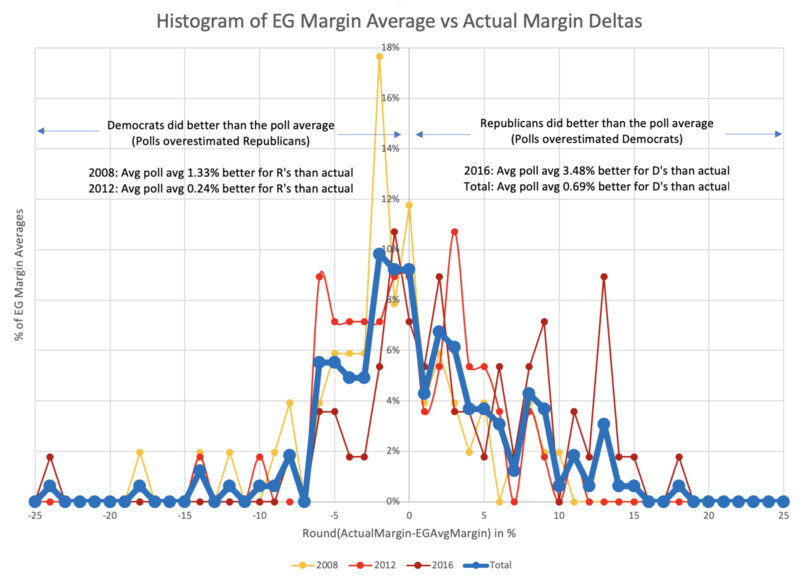 This is the fifth in a series of blog posts for folks who are into the geeky mathematical details of how Election Graphs state polling averages have compared to the actual election results from 2008, 2012, and 2016. If this isn’t you, feel free to skip this series. Or feel free to skim forward and just look at the graphs if you don’t want or need my explanations. So, after the Predicting 2016 by Cheating post went up, Patrick Ruffini decided to quote tweet it, after which Nate Silver replied saying "whoever did that is incompetent". In any case, despite being incompetent, I will soldier on. This is not my day job. I make no money off this. I never expect to make any money off this. I just enjoy doing it. I am always happy to take constructive criticism. I've changed things on the site based on reader feedback before, and undoubtedly will again. Also though, in this series of blog posts specifically, I have been exploring different ideas and ways of looking at the 2008-2016 data. 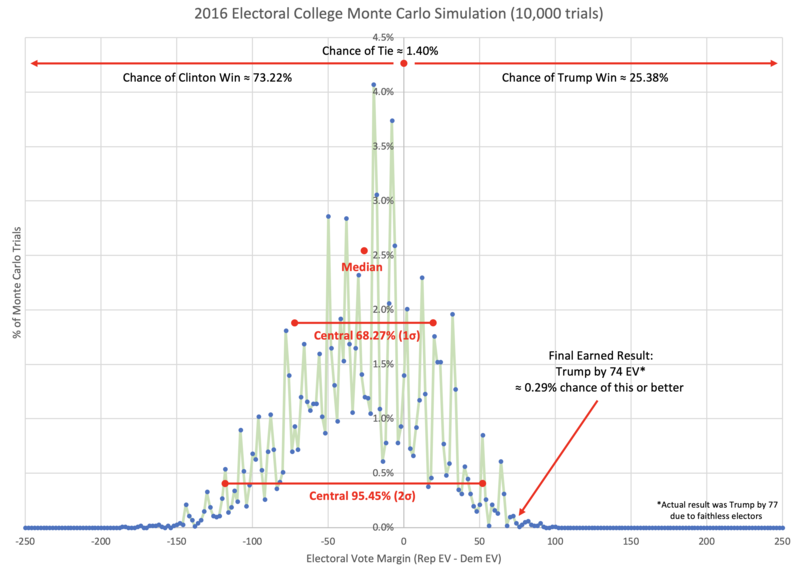 The Monte Carlo simulation in the last post was NEVER a valid prediction for 2016, because it used the actual results of 2016 in the model. Which I said repeatedly in that post. It was just a proof of concept that using that data in that way would provide something reasonable looking. I'm not sure if Nate actually read the posts describing how I was modeling things and all the caveats about how running that simulation was cheating since I was using 2016 data to predict 2016. Maybe he did. Maybe he didn't. He is right of course that the Monte Carlo graph he was reacting to does give a much narrower distribution than his model did. 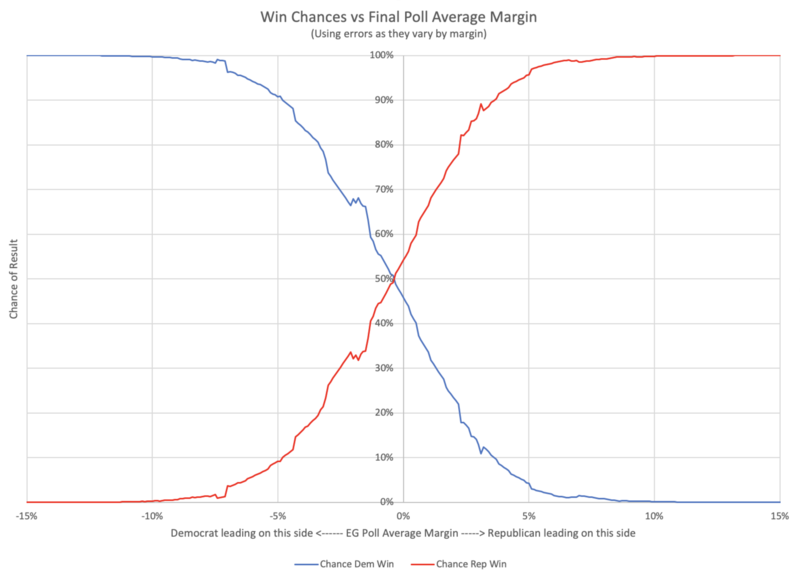 The Polling Error vs Final Margin post shows how I got the probabilities that led it to be that narrow. The distribution is actually narrower than I expected coming in. But that particular way of looking at the data leads there. It may or may not be a good way of looking at things. I am experimenting. Having said that, the results gave Trump win odds near what FiveThirtyEight had, but with the median being further toward Trump than their model, and with a narrower distribution. Looking at some other folks who showed distributions for 2016 on their sites (and still have them easily findable today in 2019), it looks like this distribution would not have been out of place. It didn't match any of them of course, since the methodology is different from all of them. But it isn't wildly out of line. Running this on 2016 data is bogus of course, as I explained in the last post, and again a few paragraphs ago. 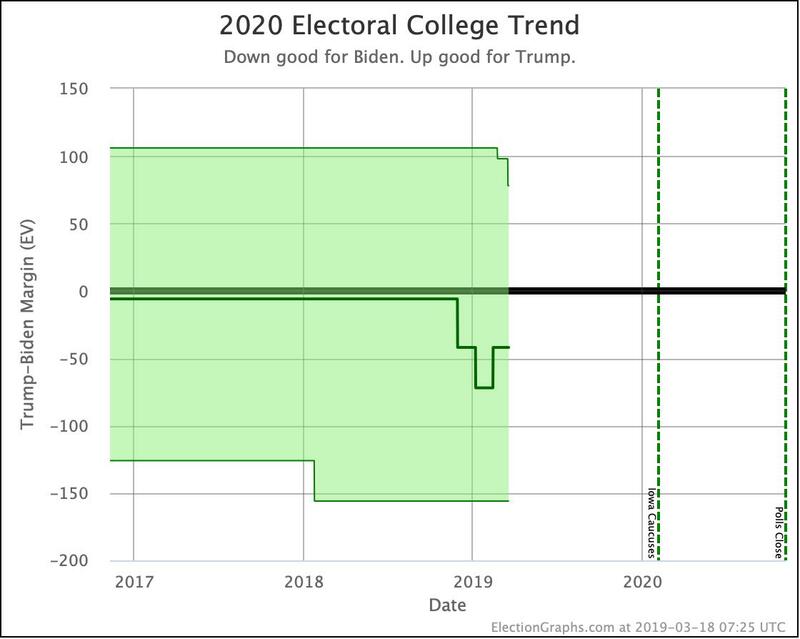 But the results are interesting enough that using the data from the analysis in the Polling Error vs Final Margin post to do some Monte Carlo simulations for 2020 would at least be fun to look at. 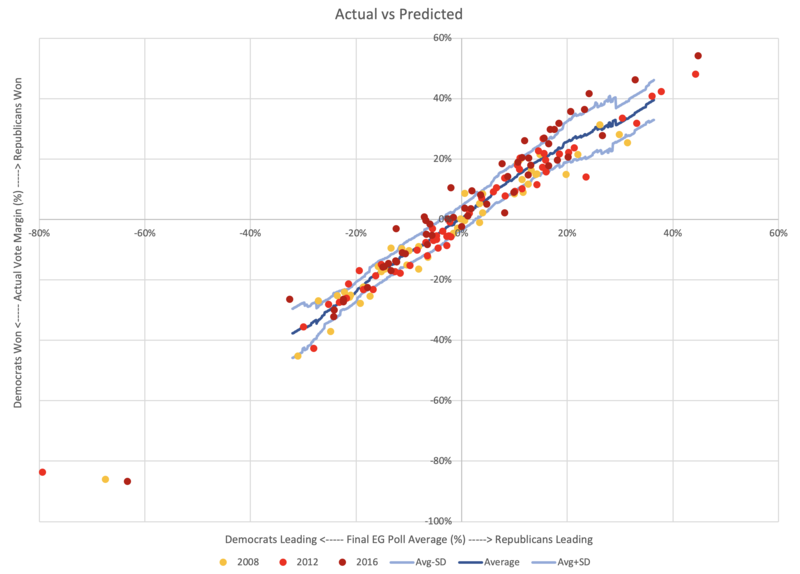 All of the previous posts have been looking exclusively at the state poll averages as they compared to the actual election results in 2008 through 2016. 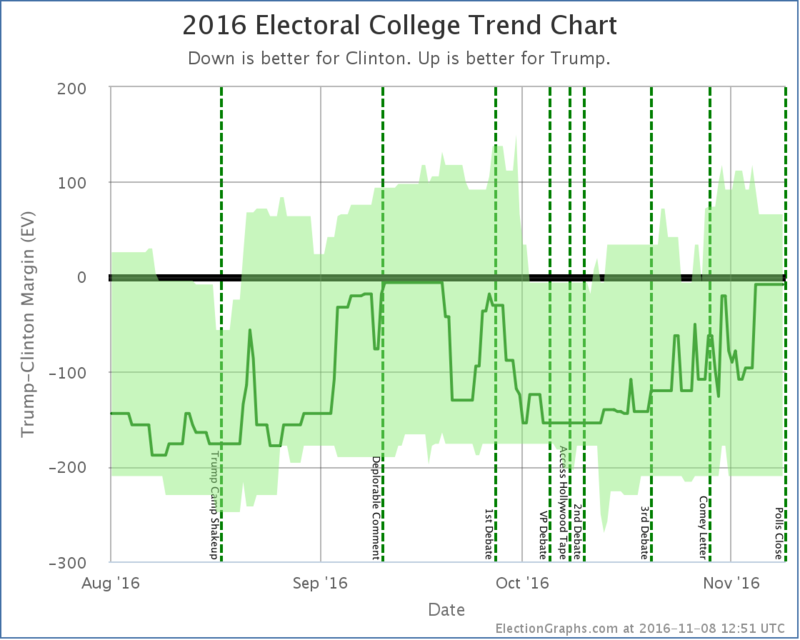 But for the last couple of cycles, Election Graphs has also looked at the "tipping point". I borrowed the idea from the "meta-margin" Sam Wang at Princeton Election Consortium uses. Basically, it is the margin in the state that would put the winning candidate over the edge if you sorted the states by margin. 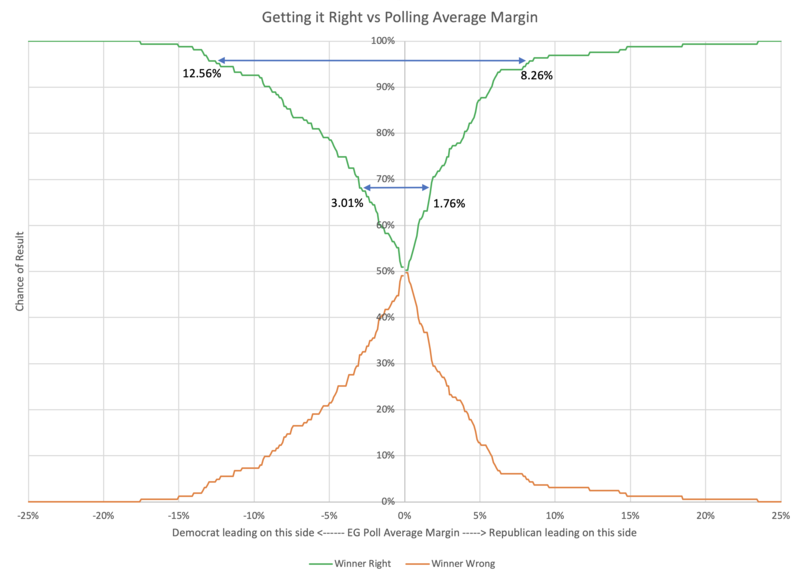 The tipping point essentially gives a measure of the overall margin in the national race, similar to a popular vote margin, but modified to account for the structure of the electoral college. 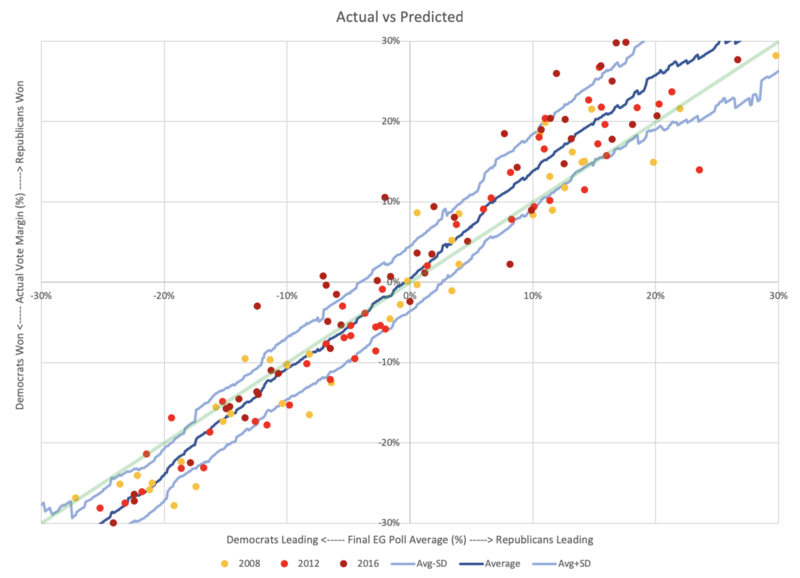 It is a nice way of looking at who is ahead and who is behind in a way that isn't (quite) as volatile as looking directly at the center line of the electoral college estimates. 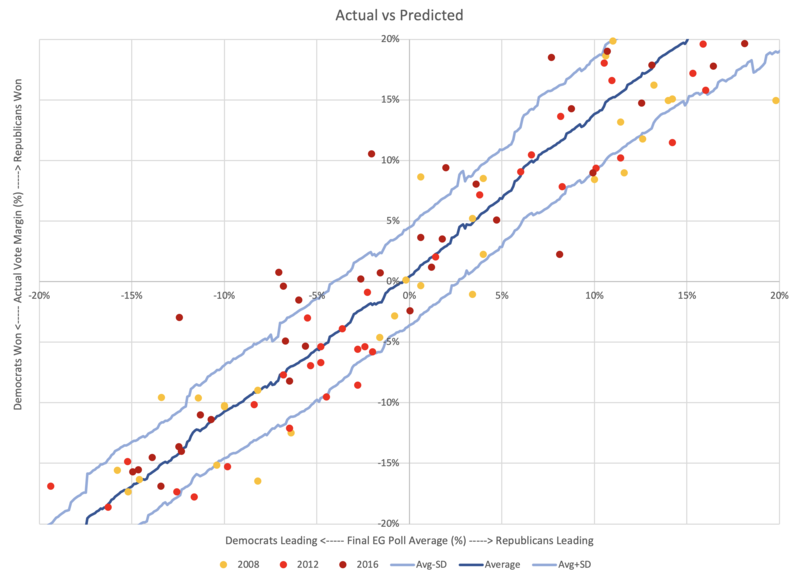 So how did the final Election Graphs tipping point numbers based on our state poll averages do compared to the actual tipping point as measured by the final vote? In 2016, I used the same 5% boundary to determine what was "close" for the tipping point as I did for state poll averages. Once again just a round number, with nothing specific behind it other than a gut feel that less than 5% seemed close. We only have three data points, but even with just that, we can produce a very VERY rough estimate of the 1σ and 2σ levels. Basically, for 1σ, you use the 2 closest of the 3 data points, and for 2σ you use all 3. This is ballpark only (at best) due to the low number of data points, but it gives an idea. So to be 68.27% sure the current leader will actually win, you want a tipping point margin greater than 2.36%. 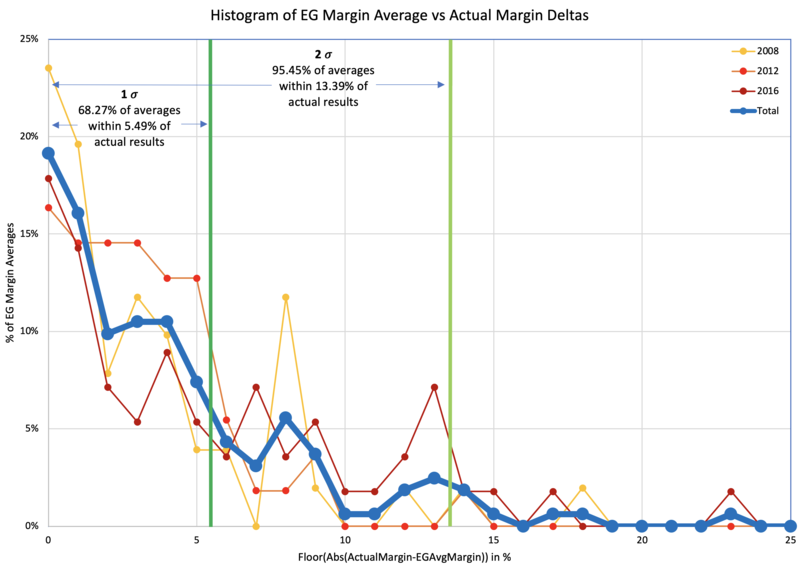 For 95.45% confidence, you want a tipping point margin lead of more than 3.45%. OK, OK, that is kind of pathetic. I know. But there is only so much you can do with only three data points. Clinton's final tipping point margin in 2016 was only 1.59% in Pennsylvania. Even assuming you only knew the 2008 and 2012 results, it should have been clear that a 1.59% tipping point represented an incredibly close race, far closer than either 2008 or 2016, and well within the realm where it could have gone either way. 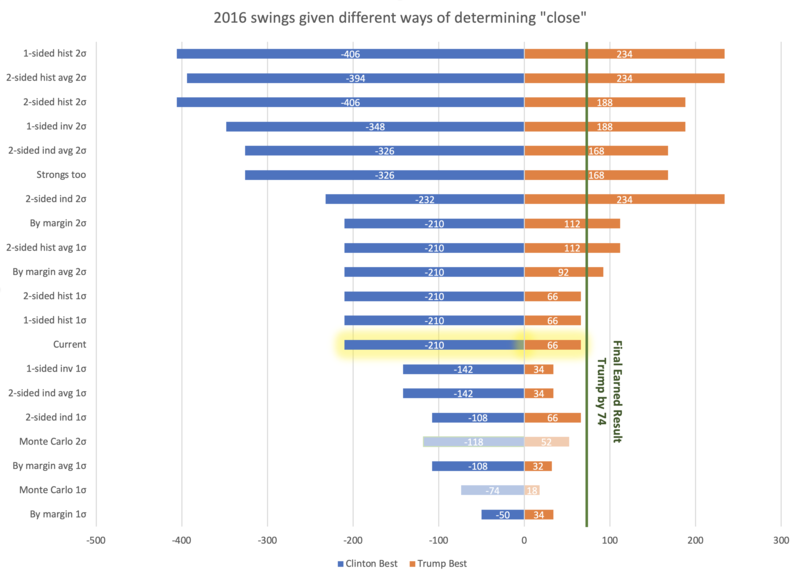 The 5% boundary Election Graphs used in 2016 also indicated a close race of course, but narrowing that boundary based on the results of the last three elections seems like it would give a better impression on how close things need to be before we should consider that things really do look like a toss up where anything could reasonably happen. 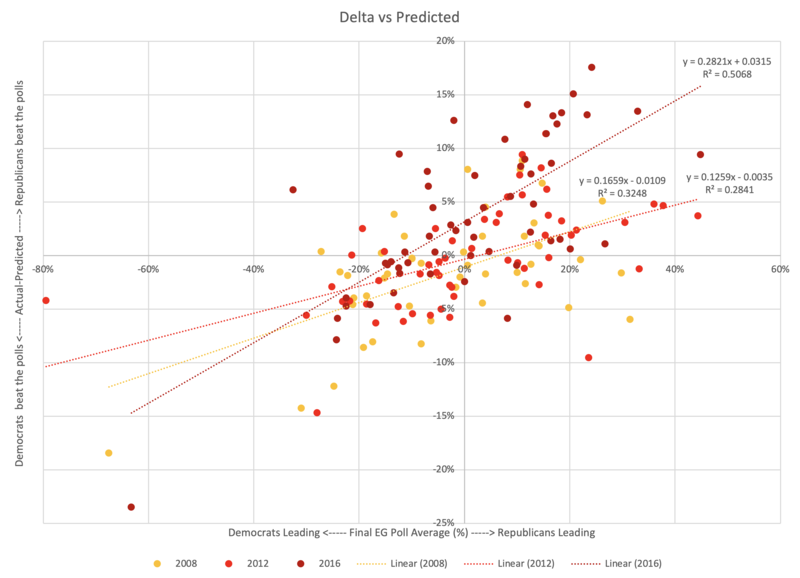 So, what, if anything, will Election Graphs actually do differently for the 2020 cycle compared to 2016? This is the fourth in a series of blog posts for folks who are into the geeky mathematical details of how Election Graphs state polling averages have compared to the actual election results from 2008, 2012, and 2016. If this isn’t you, feel free to skip this series. Or feel free to skim forward and just look at the graphs if you don’t want or need my explanations. 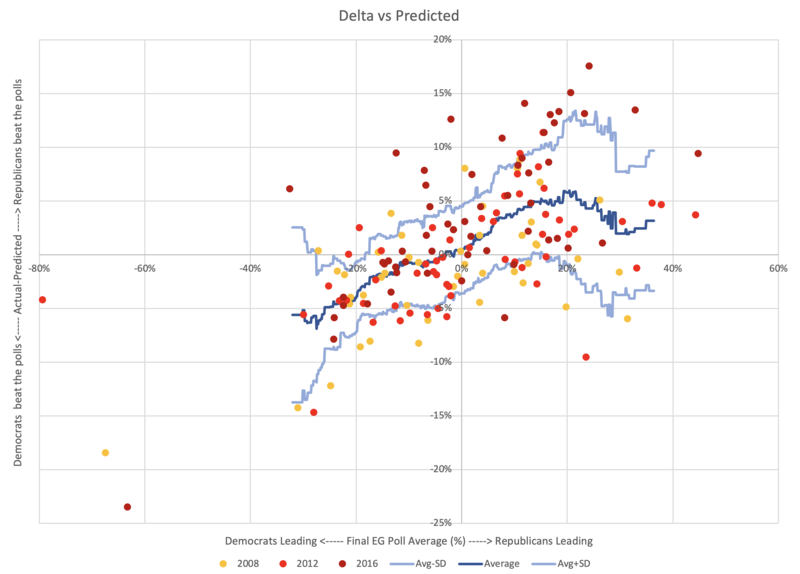 In the last post I used the historical deltas between the final Election Graphs polling averages in 2008-2016 to construct a model that given a value for a poll average, would produce an average and standard deviation for what we could expect the actual election results to be. So what can we do with that? I don't have another election year with data handy to test this model on. No 2020, no 2004, no 2000, no earlier cycles either. So I'm going to look at 2016, even though I shouldn't. The only one that is really surprising is Wisconsin, just as it was on Election night in 2016. Every other state was clearly a close race, where nobody should have been shocked about it going either way. Wisconsin though? It was OK to be surprised on that one. OK, and maybe the margin in ME-CD2, but not that Trump won it. Let's go a bit farther than this though. 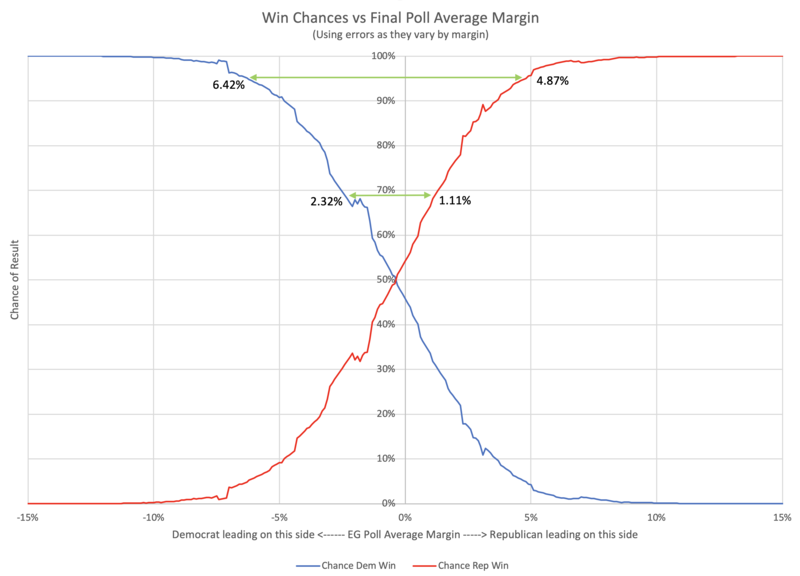 One thing Election Graphs has never done is calculate odds. 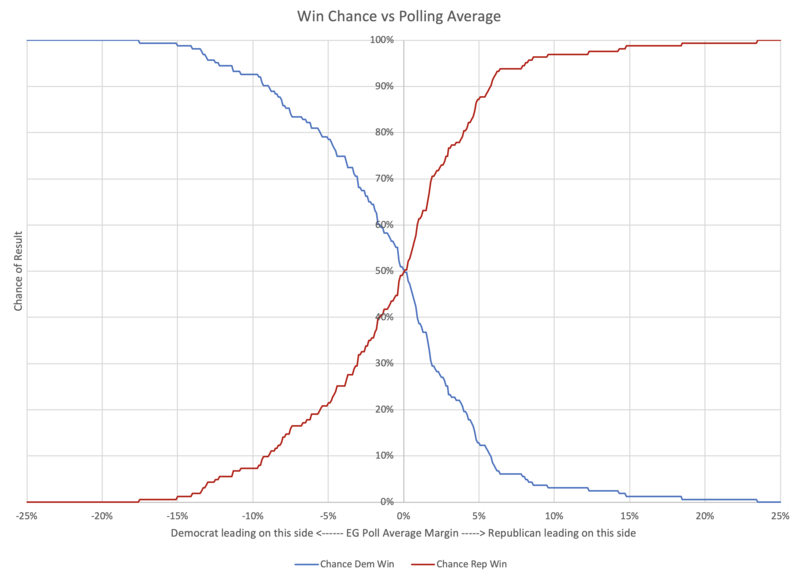 The site has provided a range of likely electoral college results, but never a "Candidate has X% chance of winning". 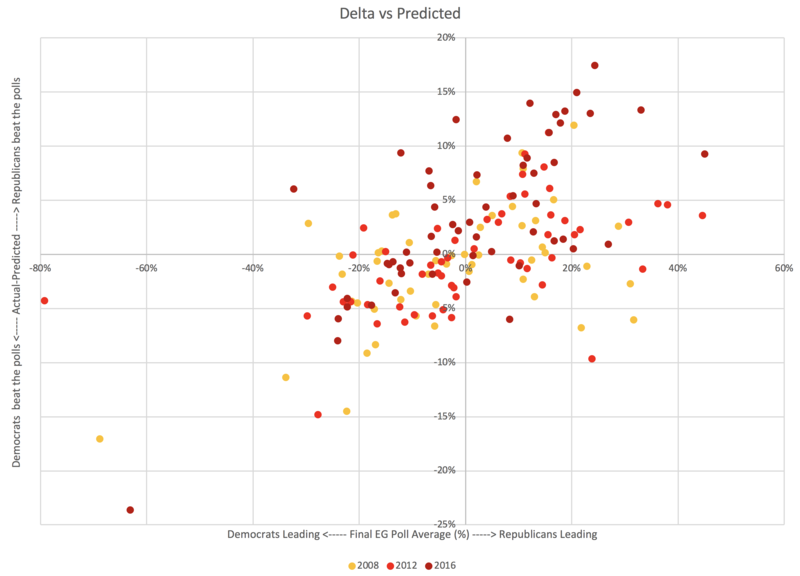 But with the model we developed in the last post, we now have a way to generate the chance each candidate has of winning a state based on the margin in the poll average, and with that, you can run a Monte Carlo simulation on the 50 states, DC, and five congressional districts. Now, once again, it is kind of bogus to do this for 2016 since 2016 data was used to construct the model, but we're just trying to get an idea here, and we'll just recognize this isn't quite a legitimate analysis. Well, that is a fun graph. It puts the win odds for Trump at 25.38%. 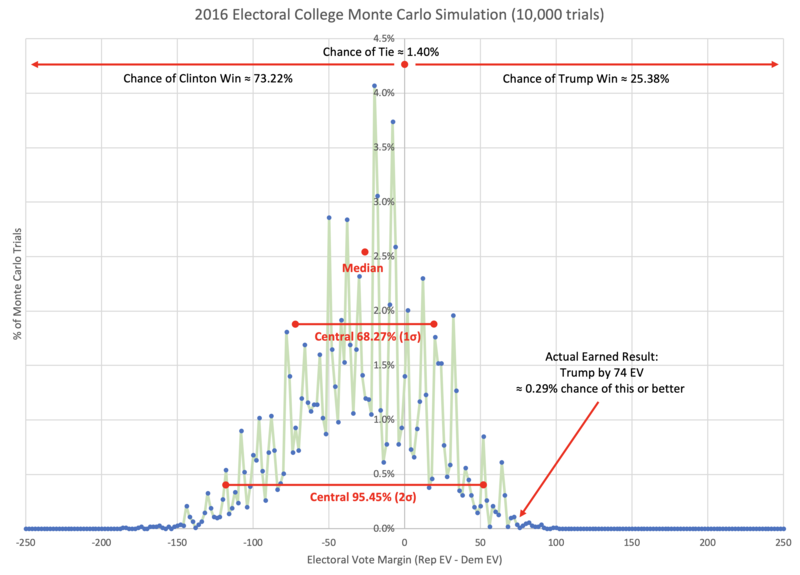 So this Monte Carlo simulation using the numbers calculated as I have described would have given Trump better odds than anybody other than FiveThirtyEight. Again though, I am cheating here. A lot. But here is the thing. 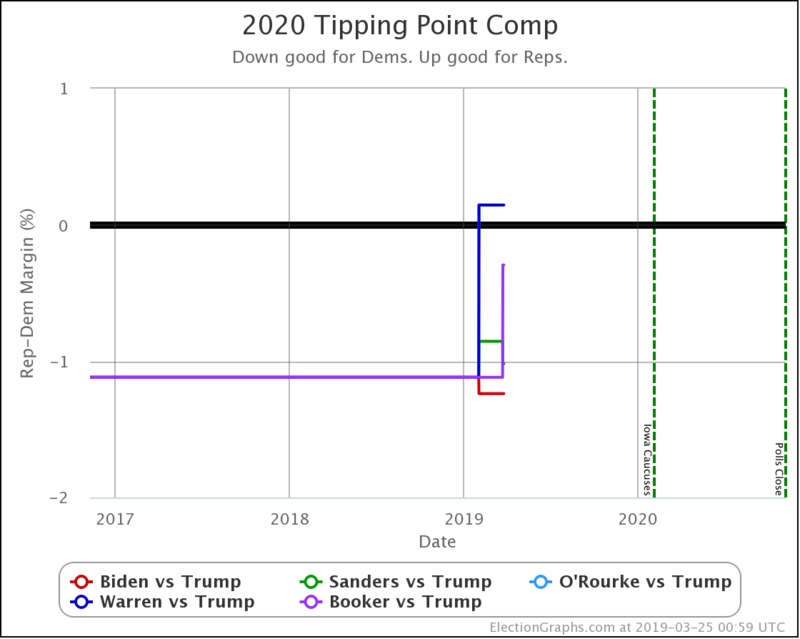 Even though I would be giving Trump pretty good odds with this model, the chance of him actually winning by as much as he did (or more) is actually still tiny at 0.29%. With these odds a Trump win should not have been a surprise, but a Trump win by as much as he actually won by… that still should have been very surprising. 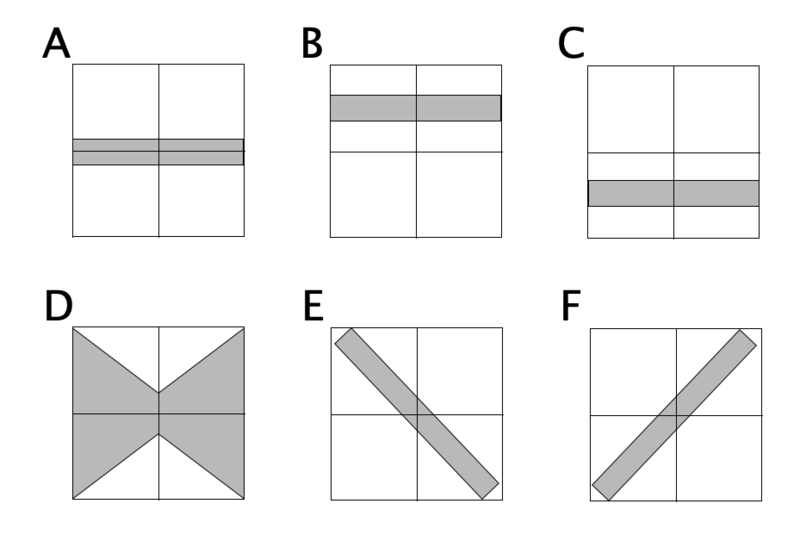 In this series of posts, we've been looking at a whole bunch of different ways of answering the basic question "what is a close state?". One reason I am looking at this is that the way Election Graphs has done our "range of possibilities" in the past is just to define what a close state is, and then let all of them swing either to one candidate or the other, and see what the range of electoral college results would be. The two showing the ranges from the Monte Carlo simulation are dimmed out because they are determined by a completely different method, not swinging all close states back and forth. It is interesting that both the 1 sided and 2 sided histogram 1σ boundaries would end up with the exact same boundaries as my current 5% bounds. But as you can see there are a ton of different ways to define "too close to call" which result in a huge variation on how the range of possibilities gets described. So what to do for 2020? 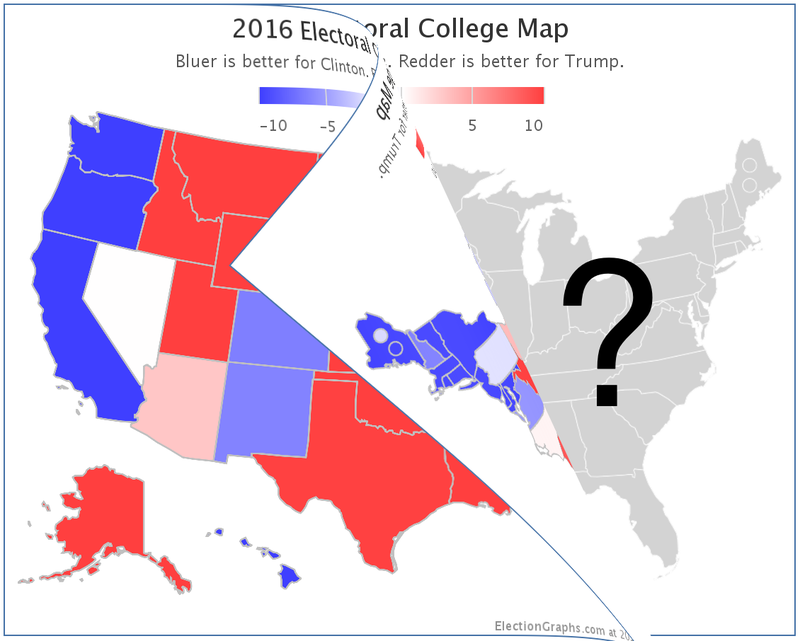 How will I define close states? You'll have to wait a little longer for that. Before I get to that, it is also worth looking at the national race as opposed to just states. 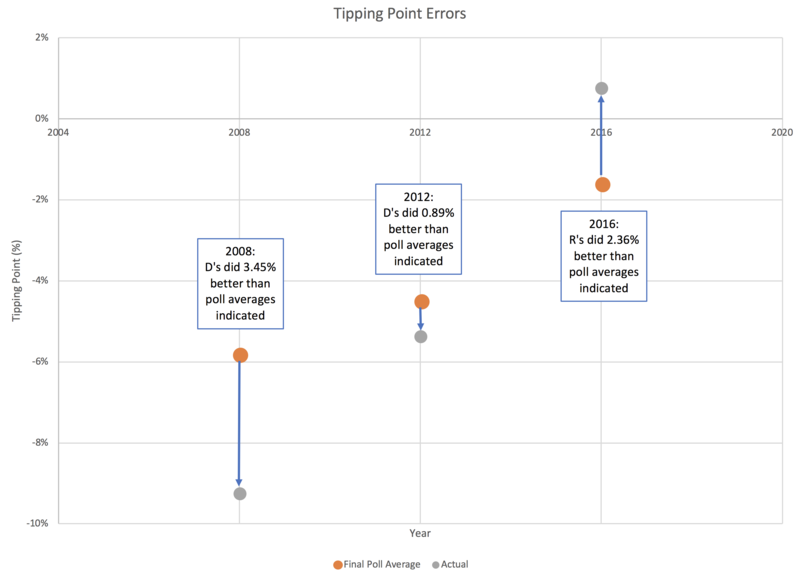 On Election Graphs I have used the "tipping point" to measure that. 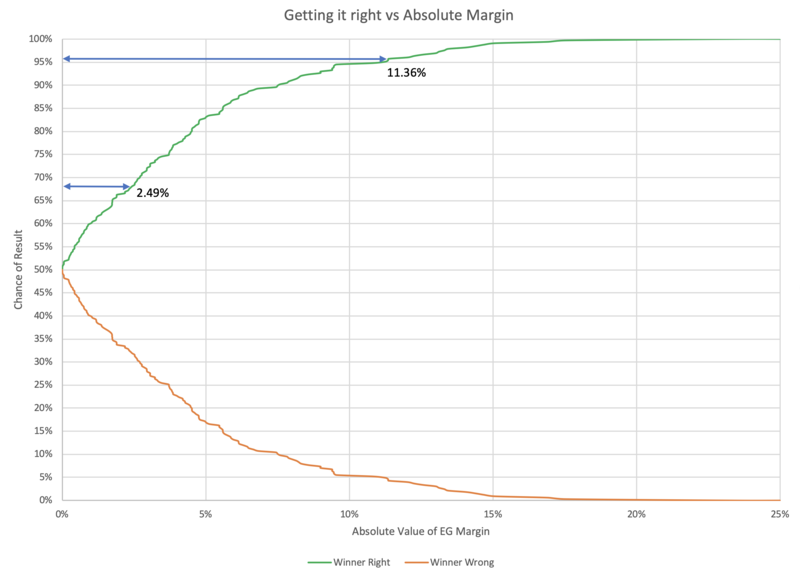 What tipping point values should be considered "too close to call"? I'll look at that in the next post….